M&A occurs throughout many different industries and includes a variety of complex financial transactions. Deals have an immense impact on the involved parties and each one is unique. This page goes over the reasoning behind M&A transactions, different types, strategies, examples and more. What is M&A (Mergers and Acquisitions)? M&A - the consolidation of companies or assets through varying types of financial deals. These transactions include mergers, acquisitions, consolidations, tender offers, purchase of assets, and management acquisitions. The term M&A doesn’t just refer to the actual deal. The term M&A also refers to the name of the departments that manage and execute deals. Once a merger is complete, the acquired company is often "erased from existence" and functions as a part of the acquiring company. During an acquisition, the acquiring company claims a majority stake in the firm to be acquired. The latter does not need to change its name or its legal structure in order to abide by the laws of the deal. For example, Alphabet, Google’s parent company, has acquired over 200 smaller companies to date, including the likes of Picasa and Android Inc. There are various reasons why companies go through an M&A process. One reason is to grow market share, commonly referred to as a horizontal merger. In this type of deal, a company is buying a competitor’s business to grow their own. Another reason behind an M&A deal, is to increase supply-chain pricing power, also known as a vertical merger. This is when a company would purchase one of its distributors or supplies, to cut down on costs. Merger - A merger is a corporate strategy of combining two separate entities into a single company in order to increase the financial and operational strengths. One reason companies often decide to merge is to save on production costs. Another reason is to achieve enough capital to enter new markets or launch new products. These types of financial transactions are heavily regulated by the U.S. Department of Justice (DOJ) and Federal Trade Commission (FTC) in order to prevent illegal deals and protect consumers from illegal pricing. An Acquisition - is the purchase of all or a portion of a corporate asset or target company. (www.merriam-webster.com) Acquisitions are a way for a company to achieve substantial growth seemingly overnight, build on the target company's strengths, and capture synergies. Other reasons behind acquisitions include increased market share, new technologies, control underutilized assets, and access to thorough distribution channels. During an acquisition, the acquiring company buys the target company’s asset shares which gives the acquirer decision making power concerning the acquired assets. The two terms, merger and acquisition, both describe the joining of two companies, but they should not always be used interchangeably. When a merger happens, two different entities create a newly formed organization. There is new ownership and management structure, typically including employees from each company. They require no cash to complete, but each company is giving up some authority. Following an acquisition, there is not a “new company” and the company being acquired commonly ceases to exist. The acquirer also takes over all operational management decisions. This type of deal requires large amounts of cash and is generally perceived as hostile, where as a merger is considered friendly. Since acquisitions are widely viewed as hostile, people often use the term merger instead even if it doesn’t appropriately apply to the deal. A new commonly used term to describe transactions is an M&A deal, instead of either merger or acquisition. M&A strategy is the reasoning and plan behind M&A transactions. Overall, the motive behind most M&A deals is to either increase financial performance or reduce risk. Behind these two motives lies more specific reasons such as synergies, economy of scale, economy of scope, increased market revenue, cross-selling, taxation, and more. M&A can be used to achieve each of those goals, but a strategy must be built around them. Due to the high value and uniqueness of eM&A transactions, no two deals are alike, and neither are their strategies. 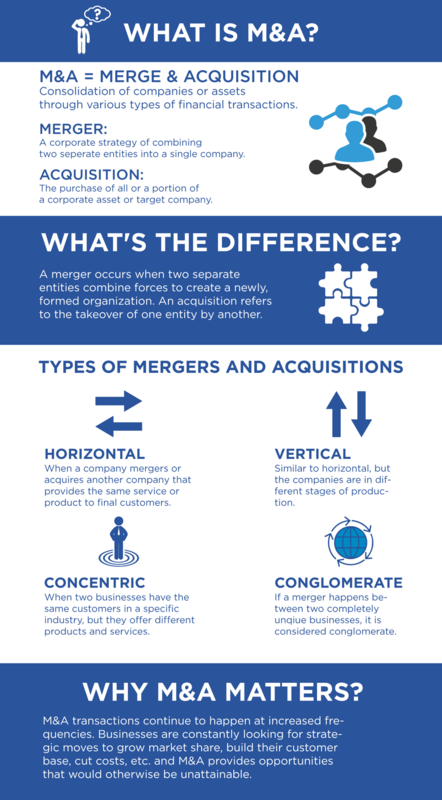 There are different types of mergers and acquisitions including horizontal, vertical, concentric, and conglomerate. A horizontal merger is when a company mergers or acquires another company that provides the same service or product to final customers. Both companies are in the same industry, have the same customers, and are at the same stage of production. A vertical merger is similar but the companies are in different stages of production. For example, if a car company acquired another company that supplied seat belts for the cars, that would be a vertical merger. Both companies are in the same industry, but separate stages of production. Another type of M&A is a concentric merger. This is when two businesses have the same customers in a specific industry, but they offer different products and services. For a merger to be considered concentric, the products or services must complement each other. An example of a concentric merger would be if a cell phone company merged with a cell phone case company. If a merger happens between two completely unique businesses, it is considered a conglomerate merger. This type of M&A is typically done to expand into other industries. Disney and Pixar / Marvel: In 2006, Walt Disney Co. acquired Pixar for $7.4 billion. Since then, movies such as Finding Dory, Toy Story 3, and WALL-E, have generated billions in revenue. Three years after the Pixar acquisition, Disney’s CEO Bob Igner, set out to acquire Marvel Entertainment for $4 billion. Considering 11 Marvel movies have brought in more than $3.5 billion since the acquisition, this is seen as a strategic and successful move by Disney. Exxon and Mobile: In 1998, Exxon Corp. and Mobil Corp. made news when they announced their plan to merge. At the time, the companies were the first and second largest U.S. oil producers. The deal closed at a whopping $80 million and since the deal was made; investors have quadrupled their money and shares have gone up 293 percent with dividends reinvested. Vodafone and Mannesmann: The merger between Vodafone and Mannesmann occurred in 2000, and was worth $180 billion. This is the largest M&A transaction in history. Vodafone, a mobile operator based in the United Kingdom, acquired Mannesmann, a German owned industrial conglomerate company. This deal made Vodafone the largest mobile operator, and aimed to set the stage for future telecom deals. Ironically enough, even though it is the largest merger to date, it was not successful. America Online and Time Warner- American Online, known by most people as AOL, acquired Time Warner for $164 billion in 2000. During the time of the acquisition, the most common way to access the internet was through their landline phone service provided by AOL. Due to the change in the way Americans accessed the internet and various company cultural issues, the deal only lasted nine years and Time Warner became an independent company in 2009. Pfizer and Warner-Lambert: In 2000 Pfizer acquired Warner-Lambert for $90 billion, both companies in the pharmaceutical drug industry. It is known as one of the most hostile acquisitions in history, due to the fact that Warner-Lambert was originally going to be acquired by American Home Products, a consumer good company. American Home Products walked away from the deal, resulting in large break-up fees, and Pfizer swooped in. Pfizer had their eye on Warner-Lambert because of a highly demanded cholesterol medication Lipitor. “Pfizer had commercial rights to Lipitor, but Pfizer was splitting profits on it with Warner-Lambert, and in 1999, Warner-Lambert sued Pfizer to end their licensing pact.” (businessinsider.com) The acquisition created the second largest drug company and Pfizer obtained control of Lipitor’s profits, which amounted to over $13 billion. M&A transactions continue to happen at increased frequencies. Businesses are constantly looking for strategic moves to grow market share, build their customer base, cut costs, etc. and M&A provides opportunities that would otherwise be unattainable. Improve your process with DealRoom.